Home » 5 Great Keto Pancake Recipes to keep you on track! Just when you thought you’d have to do without that scrumptious stack of pancakes this weekend, you’re in store for some heavenly pleasure. 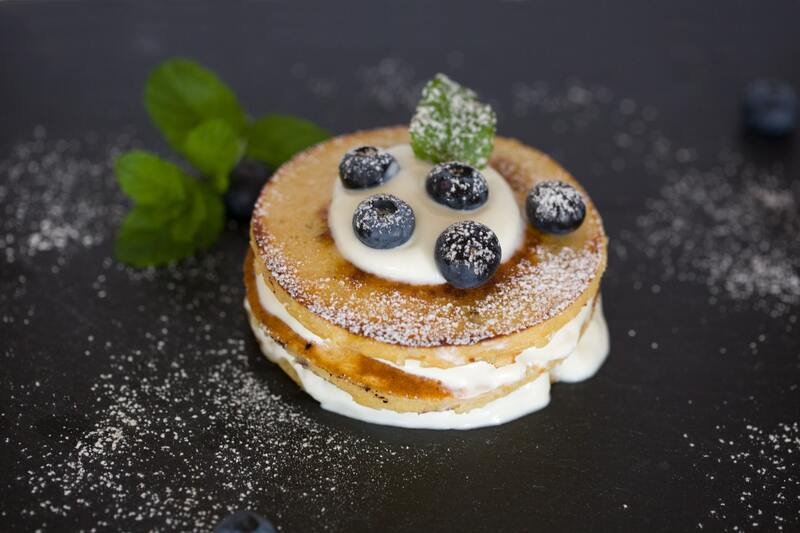 The following 5 Keto pancake recipes will have your mouth watering in anticipation. No need to sacrifice this indulgence you savored as a child. In fact, they may even taste better than the ones you fondly remember. 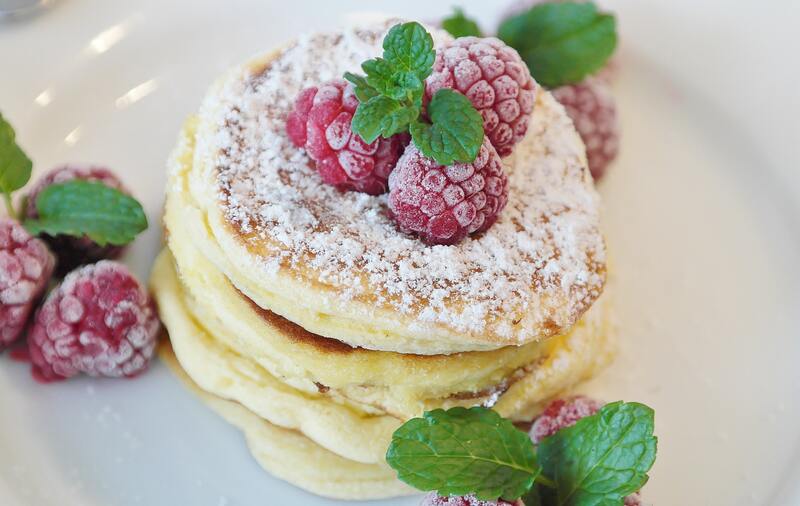 Leisurely mornings and pancakes go hand in hand, the perfect treat for the whole family. When you think of keto pancakes it automatically sparks that protective instinct—too many carbs! The entire meal is centered around flour and sugar. It’s a nightmare for anyone concerned with carbohydrate intake. Moreover, it’s not really healthy for anyone. How then, can delicious pancakes like the ones shown in the photo below have 12 carbs per serving? It’s all about the ingredients, of course! The secret is partly in the flour used. Coconut and almond flours are much lower in carbohydrates since they are derived from things other than grains. Not only that, they’re so much healthier for you. Both coconut and almonds are high in beneficial nutrients. 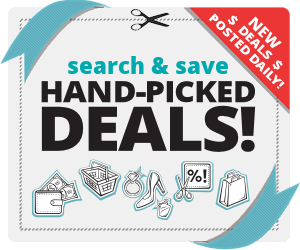 As for the sweet component, other natural alternatives to sugar will satisfy the most passionate sweet tooth and actually have no calories or carbohydrates. For example, monk fruit—a natural sweetener—is 100-200 times sweeter than sugar, so a little goes a long way. This is also true of erythritol—derived from fruit and fermented foods—and Stevia, a natural plant-based sweetener, as well. Any of these are acceptable choices when making your pancakes. You can decide which ones you prefer. 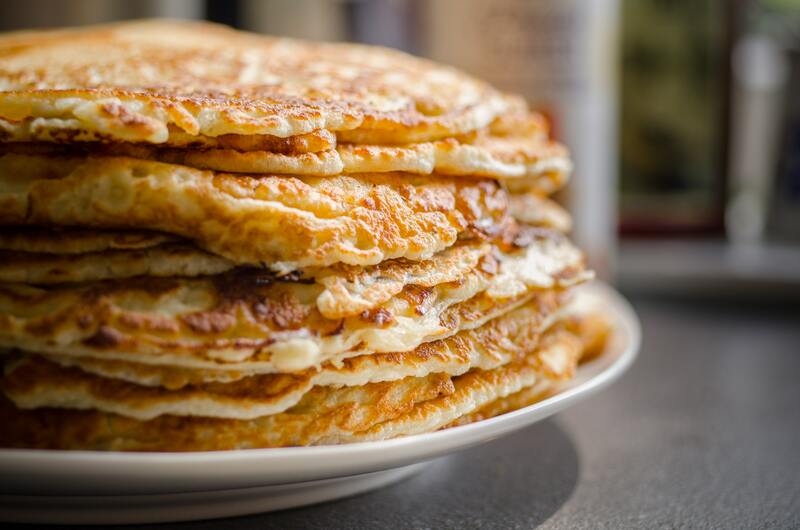 Depending on your mood, choose between any of these delicious Keto pancake recipes below. They should make 10 to 12 pancakes. Serving size is usually 4 or 5 pancakes, 12 to 15 carbohydrates total. Ingredients: 2 Tbsp coconut flour 1/2 tsp baking powder 1/4 tsp salt 2 Tbsp granulated sweetener 3 large eggs 1/4 cup whole milk 1 1/2 teaspoons vanilla extract Directions: Mix the dry ingredients including the sweetener in a large bowl. Then whip up the eggs, milk, and vanilla in a separate bowl. Combine into the larger bowl and whisk until nice and creamy. Place 1 Tbsp of butter in your skillet or use coconut or olive oil. A non-stick pan works very nicely, too if you prefer. Pour 1/3-1/2 cup batter (depending on how large you want your pancakes) in the pan and turn over when several bubbles appear, usually 2 minutes. Then cook about 2 more minutes. Make sure your burner is on medium heat so pancakes cook gradually instead of burning. To top it off you can drizzle monk fruit sweetened, all natural maple syrup, add almond shavings, or a few sliced strawberries, or blackberries. Ingredients: 1 cup almond flour 1/4 cup coconut flour 2 Tbsp sweetener 1 tsp baking powder 1/4 tsp salt 4 large eggs 1/3 cup buttermilk 4 Tbsp melted butter 1/3 cup blueberries (fresh or thawed) Directions: Whisk the melted butter, 4 large eggs, and buttermilk in a large bowl. In another bowl stir together the dry ingredients and then add to the first mixture. Whisk until smooth and then add the blueberries. Make sure to get rid of excess liquid first if thawing frozen blueberries. Prepare the skillet with 1 Tbsp butter, or coconut oil to create a smooth surface or use a non-stick pan. Pour 1/3 to 1/2 cup batter into round pancakes. Wait until pancakes begin bubbling all over, usually about 2 minutes, then flip and wait another 2 minutes. Remember to set the burner to medium so pancakes can cook gradually and not burn. If you’d like, use a little monk fruit maple syrup for added sweetness when serving along with more butter on top. Ingredients: 1/2 cup almond flour 2 Tbsp coconut flour 1/2 tsp baking powder 1 Tbsp granulated sweetener 1 pinch of salt 3 large eggs 1/4 cup unsweetened almond milk 1/4 cup sugar-free chocolate chips Directions: Combine dry ingredients, including granulated sweetener in one bowl. Whip eggs and almond milk in another bowl. Then stir together all ingredients, whisking until smooth. Add the chocolate chips. Prepare your skillet with one Tbsp coconut oil, olive oil, or butter on medium heat. Pour 1/3-1/2 cup of the batter onto pan and leave for about 2 minutes until several bubbles form, then flip the pancake over and cook for approximately 2 more minutes. 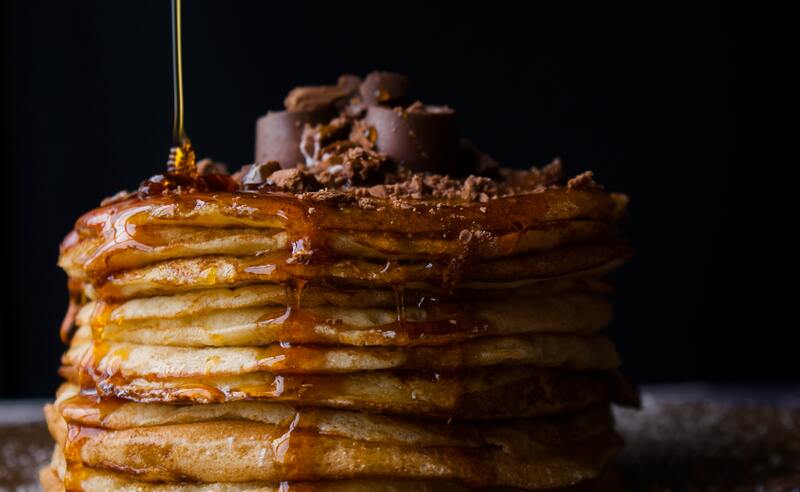 You can add sugar-free chocolate shavings, chopped nuts or coconut flakes on the top of your pancakes as well as monk fruit maple syrup if you want. Delicious! Ingredients: 6 Tbsp almond flour 2 Tbsp coconut flour 3 oz cream cheese, softened 3 large eggs 1 tsp granulated sweetener 11/4 tsp lemon zest 1/2 tsp vanilla extract Directions: Whip eggs and blend with cream cheese, vanilla and lemon zest. Add the flour and sweetener until mixture is smooth. Heat skillet on medium and add 1 tablespoon butter, olive oil, or coconut oil. Pour 1/3 to 1/2 cup batter onto skillet and cook for about 2 minutes until bubbles form and turn the pancake over for approximately another 2 minutes. Enjoy pancakes plain or with sliced strawberries or sugar-free syrup. Ingredients: 1 cup almond flour 1/4 cup coconut flour 3 Tbsp granulated sweetener 1 tsp baking powder 1 tsp cinnamon 4 large eggs 2 Tbsp butter, melted 1/2 cup whole milk Directions: Combine whipped eggs, melted butter and milk in a bowl, mixing well. Stir the rest of the dry ingredients together and then add to the wet mixture. Whisk until smooth. Heat skillet on medium and put 1 Tbsp butter, olive oil, or coconut oil and spread over the surface. Pour in 1/3-1/2 cup batter onto skillet and cook for about 2 minutes until pancake bubbles. Flip to cook another side for an additional two minutes. You can add almond shavings, sugar-free maple syrup, butter, or fresh berries over the pancakes when served. There’s nothing like the comfy coziness of cinnamon. There is no need to do without your favorite recipes on the Keto diet when you realize you can replace certain cooking staples such as white flour, sugar and unhealthy vegetable oils with healthy alternatives that make all the difference. Even better, they’re usually tastier. 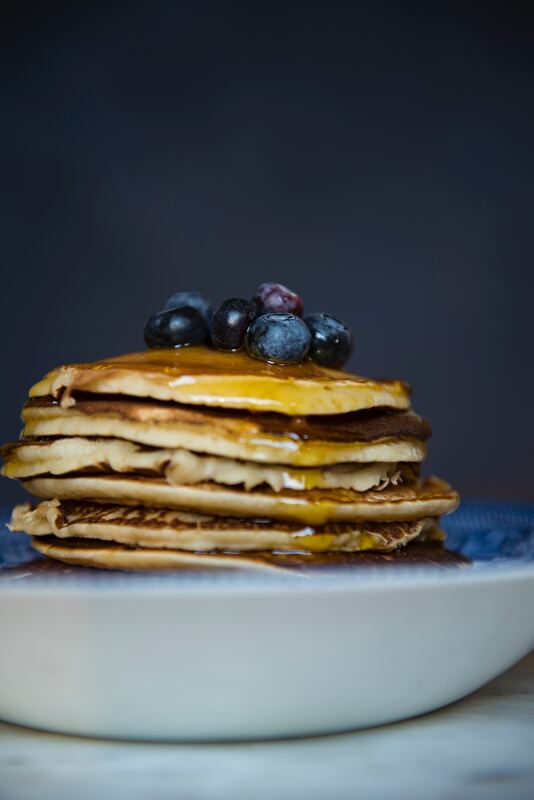 I hope these Keto pancake recipes inspire you to get creative in the kitchen. The possibilities for flavorful meals abound! Pin for Later: 5 Great Keto Pancake Recipes to keep you on track!